Aelig starts using sentences mixing Mandarin and French. Sometimes, after coming back from school, she would speak pure French to me. Most of the time I ask her to speak only Mandarin, but sometimes I just let it go. One day, she was using mixed languages again. I stopped her and explained that if she would say the same thing to my mother, my mother would not have understood. "Your grandma doesn't understand French, she wouldn't have known what you are trying to say. This is just like a chicken trying to speak its chicken language to a duck who doesn't understand a word of chicken. 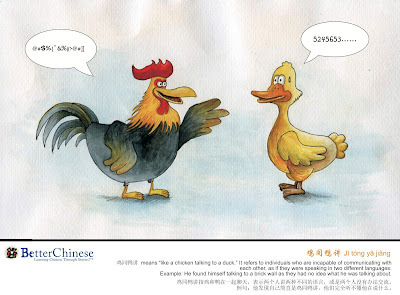 We called it chicken and duck talk in Mandarin. " I told her. "Oh I know, you are chicken, dad is duck, that's why I know how to speak Chicken and Duck languages. " Her response made me laugh, she was not wrong in her logic. Unfortunately, chicken and duck both have pejorative meanings in Mandarin. Chicken could refer to a prostitute and duck could mean male prostitute. I didn't correct her as I didn't know how to explain this to her. Anyway, during lunch time, hubby spoke in Mandarin about something. Aelig didn't get it because she didn't expect her dad to speak Mandarin. I told her that the fact she speaks Mandarin at home, it helps her father learn as well, and now he could speak simple mandarin to his mother in laws. But then she should keep doing it so that her dad would make progress. Her response : "Why doesn't dad speak English to grandma? "Because not everyone speaking English in Malaysia, including your grandma. " I promptly said. "Then dad would speak in English, and someone else would translate for him." She came out with a solution. "Well, it is better if we all can speak Mandarin to grandma. And you know, grandma had never had chance to go to school, do you know why?" "Yes, you told me that, she needed to take care of her siblings." "Yes. How about you quit going to school, and take care of your sister at home instead?" "No! I love going to school!!!" 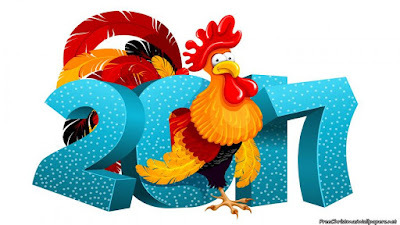 Wishing everyone happy and prosperous year of Rooster!